CCK’s Advanced Nurse Practioner, Julie Crotts, who services our Dodge City location has been honored with the 2018 Community Star award on behalf of the Cancer Center of Kansas by the National Organization of State Offices of Rural Health (NOSORH). The NOSORH was established in 1995 to assist in the efforts to improve access to, and the quality of, health care for over 60 million rural Americans. Their mission is to support the development of state and community rural health leaders; create and facilitate state, regional and national partnerships that foster information sharing and spur rural health-related programs/activities; and to enhance access to quality healthcare services in rural communities. CCK is proud to have Julie as a part of our team. Her recognition is well deserved and her commitment to providing quality care to rural Kansas is evident through her work at CCK. The Community Star is awarded to individuals who dedicate their life’s work to rural health. 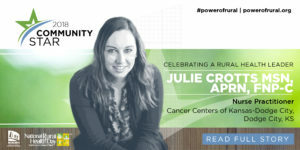 As a honoree, Julie shared her inspiring story with the Power of Rural organization and was featured in their electronic publication that released on National Rural Health Day, November 15, 2018 as well as promoted on various social media outlets. Additionally, her story and details on NOSORH were featured in the Dodge City Daily Globe newspaper. Click here for the featured article by Dodge City Daily Globe. To view Julie’s profile, hear her personal story or view the ward visit powerofrural.org. Or, to learn more about NOSORH visit https://nosorh.org/about-nosorh/.